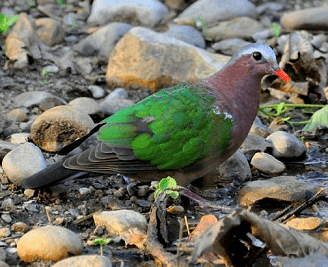 Emerald dove (Chalcophaps indica) complete detail. 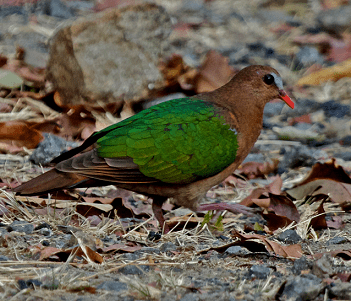 Description of Emerald dove – Chalcophaps indica. Classification of Emerald dove (Chalcophaps indica). Habit and habitat of Emerald dove. They prefer forests, woodlands, farms, gardens, and mangrove areas. Emerald dove is a beautiful bird. 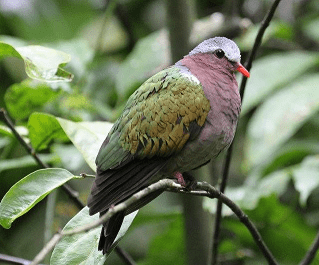 Size of adult Emerald dove is between 23 to 28 cm. Weight of adult is between 90 to 172 g. Emerald dove is a beautiful bird. 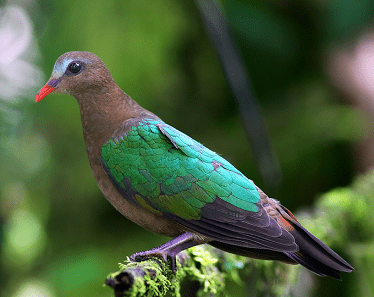 Emerald doves are very shy and secretive in nature. he color of head and neck is rufous brown. The bill is short, strong and bright orange in color. Breeding and nesting season is between April to September. They nest in the forest or closed-canopy woodlands. They builds a scant stick nest. Males perform a bobbing dance during courtship. Eggs 1 to 2, white or creamy in color. Incubated by females only. Eggs hatch in about 13 to 15 days. 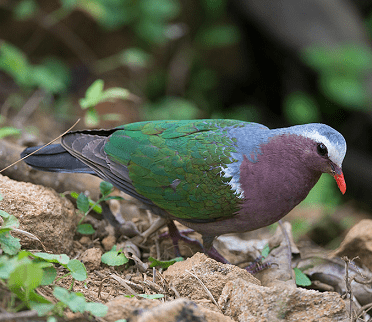 Emerald dove is a Schedule – IV bird, according to wildlife (Protection) act, 1972 and classified as Least Concern (LC) by the IUCN. Emerald dove is a beautiful bird. 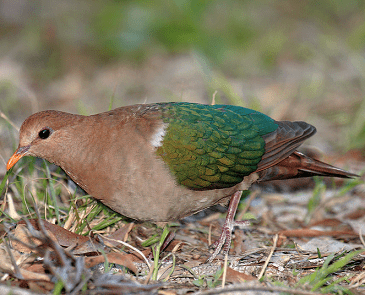 Size of adult Emerald dove is between 23 to 28 cm. Weight of adult is between 90 to 172 g.
The color of head and neck is rufous brown. The bill is short, strong and bright orange in color. The wings and shoulders are bright emerald green with the edge of the shoulders being white. The male has a white patch on the edge of the shoulders and a grey crown. Male has wine-red tints on the rufous plumage. The flight feathers and tail are blackish, and broad black and white bars show on the lower back in flight. Underparts are dark vinous brown, and fading to light rufous brown or greyish on the lower belly. The front portion of their necks and the area between their chest and upper back are also purplish-brown. The eyes are dark brown, and legs and feet bright rufous. Females will tend to have a browner complexion with a grey mark on the shoulder. Young birds resemble females but have brown scallops on their body and wing plumage. They found in tropical and sub-tropical parts of the Indian Subcontinent and east through Myanmar, Thailand, Malaysia, Vietnam, Southern China, Philippines, Indonesia and some parts of Australia. They prefer forests, woodlands, farms, gardens, and mangrove areas. Emerald doves are very shy and secretive in nature. They usually occur singly, pairs or in small groups. They feed on various types of fruits, plants and seeds. They also feed on termites. They usually forages on the ground, mostly under tree cover. They fly low and quickly, zipping in and out among trees and undergrowth. They often flies low between the patches of dense forest. They frequently walk away rather than fly when disturbed. The call is a coo… coo… coo… coo…or coo-hoo-hoon. Breeding and nesting season is between April to September. They nest in the forest or closed-canopy woodlands. They builds a scant stick nest. Males perform a bobbing dance during courtship. Eggs 1 to 2, white or creamy in color. Incubated by females only. Eggs hatch in about 13 to 15 days.